Bulldogs at T3 Wellbeing Centre. 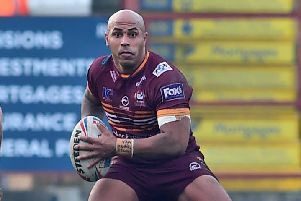 Batley Bulldogs have linked up with the T3 Wellbeing Centre to offer season ticket holders a 25 per cent discount on membership. T3 Wellbeing, based at Albion Mills, Bradford Road, Dewsbury, are already conditioning partners of the Bulldogs but supporters can now enjoy membership at a discounted rate. Author John Roe has donated the Bulldogs £500 royalties from his book, Sermons From The Mount, which will go towards the new PA system and CCTV installed at the club earlier this month at a cost of £7,270.